If you’re preparing to host a big wedding, birthday party, corporate event, or bar mitzvah, you know how hard it is to come up with fun, exciting ideas to make your party stand out. There’s nothing worse than a boring, generic party that blends in with every other one. The best way to make sure that your party makes a lasting impression is to incorporate unique, memorable ideas that boost your event’s atmosphere. 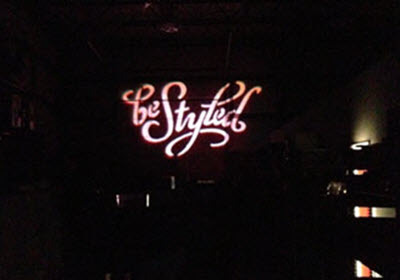 Stay on the cutting edge of the latest party trends and order a custom gobo for your next big event! Gobos have their origin in theatrical lighting design. They’re essentially a stencil that gets placed inside or in front of a light source to create a pattern, design, or image out of shadow and light. Gobos can be made of metal, plastic, or glass. They come in generic shapes, like stars, hearts, or leaves, but they can also be molded into custom designs. They can also be monochromatic or multicolored. In addition to playing a huge role in the art of theatrical lighting design, gobos are also frequently used in architectural design, at nightclubs, and most importantly, at parties and events. What Kinds of Designs Can Be Made into Gobos? There are almost no limits to the kinds of designs and artwork that can be made into gobos. Many lighting designers and nightclubs tend to use standard patterns. These kinds of gobos have a repeated pattern stamped into them. When placed inside or in front of a light, they create a spray of small identical images, like dollar signs, butterflies, or music notes. They’re great for creating an exciting, ethereal atmosphere. Standard gobos can also be stamped with one, large, singular image or symbol. When placed inside or in front of a light, these gobos project a large version of that image onto the floor, wall, curtains, or ceiling. This image can be fairly simple, like a heart or a cross, or more complex, like a flag or an astrological sign. There is a surprisingly wide variety of large standard designs available. You can choose from many themes, ranging from religious imagery to holiday patterns to nature. Finally, a custom-made gobo can be stamped with practically any message or piece of artwork you’d like. You can stamp anything from a short message to an entire word cloud onto a gobo. You can also ask that a custom piece of artwork be stamped onto your gobo. It can be your company’s logo, the names of the bride and groom at your wedding, or even a drawing or pattern of your own. You can even design a custom gobo that projects a multicolored image using several colored light sources! 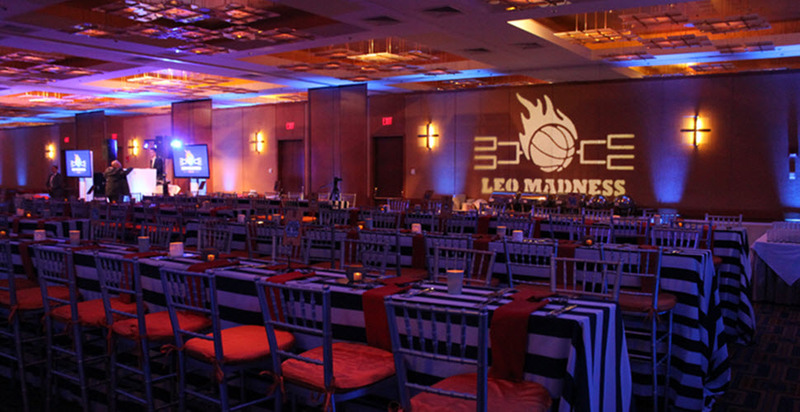 Why Should I Consider a Custom Gobo for My Party? Custom gobos are the perfect way to elevate your party from generic to unique. With a custom gobo, you can illuminate your party’s dance floor, project well-wishes onto the walls, or put a personal stamp onto the curtains or ceiling. Although a piece of custom-made light art might seem like a minor detail, a custom gobo is actually an amazing way to make any party or event feel more upscale and special. Plus, with recent advances in technology, getting a custom gobo made is actually much more affordable than you might think! You can boost the atmosphere of your party from bland and blasé to memorable and personal with just one piece of affordable, custom lighting! Let Creative Event Services Take Your Party to the Next Level! If you live in the Boston, Hartford, or New York areas, consider hiring Creative Event Services to help you make your party more fun, exciting, and memorable. Creative Event Services provides amazing black-and-white and multicolored custom gobos at affordable prices. In addition to custom gobos, Creative Event Services can also provide your party with unique, festive activities like photo booths, Virtual Reality goggles, giant board games, caricature artists, psychics and tarot card readers, casino games, and so much more! Don’t settle for planning a boring, bland party. Let Creative Event Services help you plan an amazing event that no guest will ever forget!